Neutrinos are a type of particle that pass through just about everything in their path from even the most distant regions of the universe. The Earth is constantly bombarded by billions of neutrinos, which zip right through the entire globe, houses, animals, people - everything. Only very rarely do they react with matter, but the giant IceCube experiment at the South Pole can detect when there is a collision between neutrinos and atoms in the ice using a network of detectors. New research results from the Niels Bohr Institute among others have measured the neutrinos at the South Pole and have calculated some of the physical properties of the otherwise exotic and poorly understood particles. The results are published in the scientific journal Physical Review D.
Neutrinos are among nature's most abundant particles. Their number far exceeds the number of atoms in the entire universe - yet we know little about them. Neutrinos are a type of particle created in the Big Bang and are also produced in the Sun's interior and in violent events like supernovae, which are exploding stars. Neutrinos are also called 'ghost particles' because they basically do not interact with matter, but pass undisturbed through everything in their path. 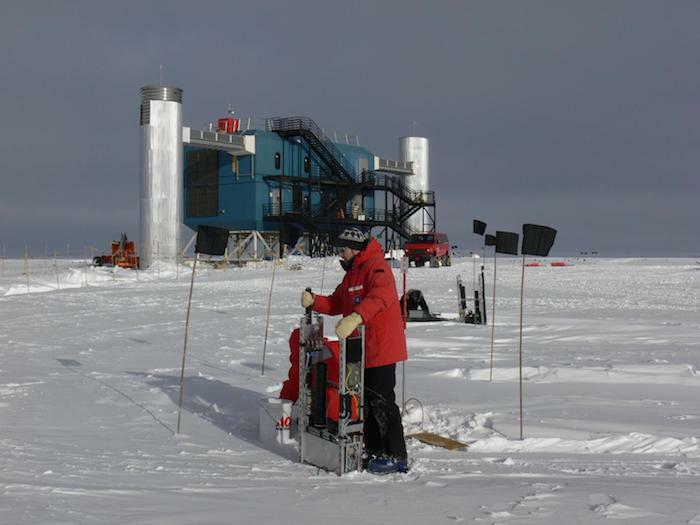 Researchers from 44 institutions in 12 countries are part of an international project, IceCube at the South Pole to study the mysterious particles with the strange properties. IceCube is an enormous particle detector located deep in the ice at the South Pole. The instruments in the detector are comprised of 86 cables each with 60 digital Optical Modules (extremely sensitive light sensors). Each cable is lowered down into a hole, which is melted through the 2½ km ice sheer using a hot water drill. The detector is located deep below the surface - it starts 1½ km below the ice and ends at the bottom at a depth of 2½ km. The detector's enormous size of a cubic kilometer is necessary because neutrinos interact extremely weakly with matter, so it is only rarely that they collide with the atoms in the ice. When they finally collide, charged particles are created, which emit radiation that can be detected by the extremely sensitive Digital Optical Modules. "In the Ice Cube project we have registered about 35 neutrinos, which are very likely to have come distant regions in space. They have a very high energy and because they have not interacted during their long journey, they can carry information from the most distant parts of the universe. In addition to the rare cosmic neutrinos, we are also studying the neutrinos created in the Earth's atmosphere in order to unravel the physical properties of neutrinos," says Jason Koskinen, Assistant Professor and head of the IceCube Group at the Niels Bohr Institute, University of Copenhagen. When particles (protons) with high energy - from violent events in the cosmos like supernovae and quasars hit the Earth's atmosphere, a burst of neutrinos is formed, which passes through the Earth. The neutrinos formed over the North Pole pass straight through the Earth and very small proportion of them hit the ice at the South Pole, where the IceCube detector registers the collisions. Neutrinos are very light particles and for many years it was believed that they were completely massless. It is now believed that there are three types of neutrinos (electron, muon and tau neutrinos), each with their specific mass, which is incredibly small - less than a millionth of the mass of an electron. "The neutrinos created in the atmosphere over the North Pole are mostly muon neutrinos. On their way through the Earth's 13,000 km, the muon neutrinos undergo quantum fluctuations that can change them into another type of neutrino, tau neutrinos, before they are finally detected by IceCube on the other side of the globe. We can now study these effects in much greater detail than before and in this way we can gain new insights into their physical characteristics," explains Jason Koskinen. The research group has now studied atmospheric neutrinos in the IceCube detector at the South Pole for three years and have analysed 5,200 interactions between atmospheric neutrinos and atoms in the ice. "We have confirmed that neutrinos undergo fluctuations - even at high energy levels and we have calculated how much they exhibit these oscillations. In this study, we have only measured muon neutrinos and in comparison to how many muon neutrinos form in in the atmosphere and pass through the Earth, we only see a fraction at the South Pole. The explanation is that the muon neutrinos undergo quantum fluctuations that change them into tau neutrinos and we do not see those. If they had not changed, we would see them all. Our calculations show that 20 percent have undergone quantum fluctuations and changed from muon neutrinos to another type of neutrino as they pass through the Earth," explains Jason Koskinen. And then what, you might ask? "Because we basically want to learn more about these strange particles that are everywhere in the universe and whose properties we still do not fully understand. Because neutrinos come from the cosmos, we could use them for astronomical observations and gain new insights into the structure of the universe," says Jason Koskinen.